No changes are being made for the 2018-19 academic year. An email sent to all independents Tuesday night revealed a document containing meal plan changes requiring all upperclassmen independents students, including enrolled in co-ops, to buy a $2,500 meal plan. The documents, watermarked with "DRAFT" and bearing the university's letterhead, outlined the plan. The documents are from the Princeton University Board Plan Review Committee, which is currently running focus groups on the proposal. The draft document was distributed to students Tuesday at Wilson College during the first of several residential college focus groups planned by the committee, says university spokesperson Michael Hotchkiss. No changes are being made for the 2018-19 academic year, he said. The email sharing the document suggested independents attend focus groups in the next two weeks where the mandatory meal plan for upperclassmen will be discussed. 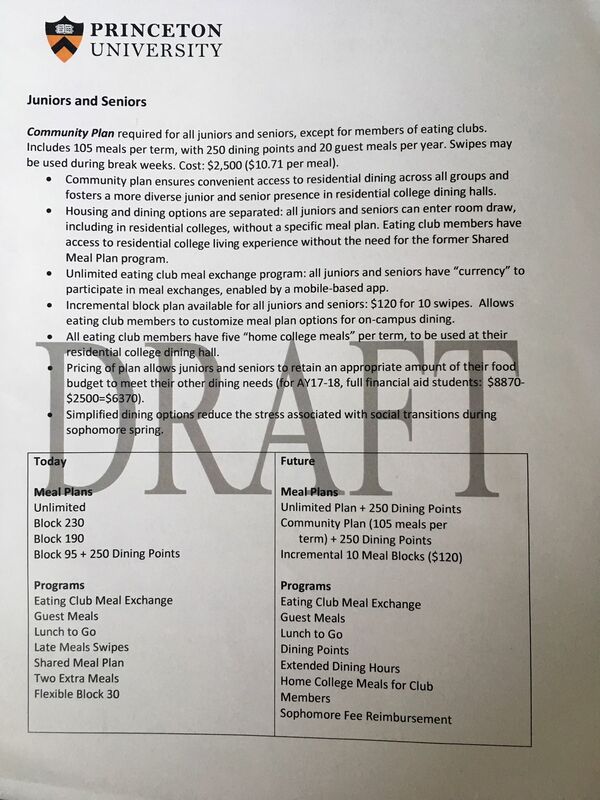 In a separate email, Deshawn Cook, Director Student Life at Butler College, publicized these focus groups as venues to discuss "new meal plans and living options." 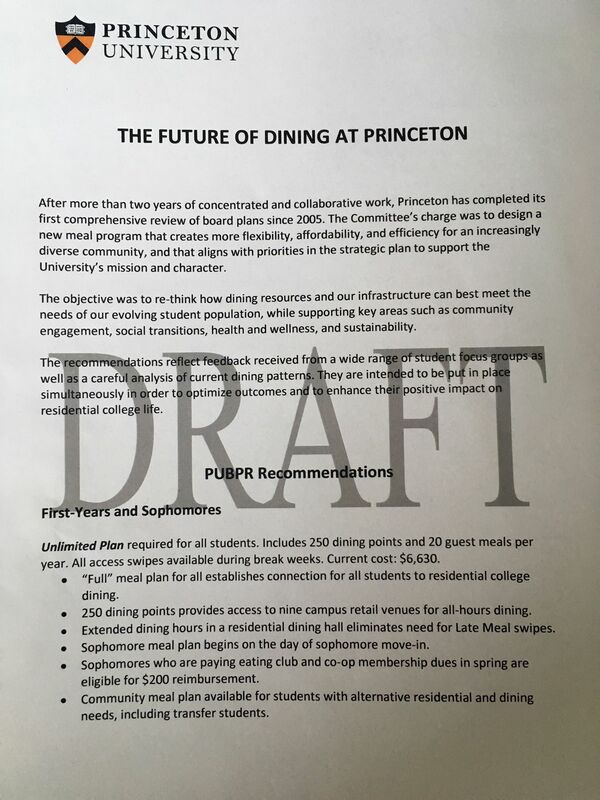 "The committee — made up of staff and students — continues to seek student input as it develops recommendations for campus dining options that support the diverse needs of Princeton’s undergraduate student body," Hotchkiss said. The Committee had hosted student focus groups in the 2016-17 year that culminated in reforms including a "lunch to go option," a digitized Meal Exchange Program, and 250 bonus dining points with the purchase of a block meal plan. These changes were piloted last fall. When those changes were announced in March 2017, they were characterized as "initial" by a university press release. The committee will continue to evaluate dining options for longer-term recommendations, the press release said. Dean of Rockefeller College Oliver Avens, co-chair of the focus groups at the time, told The Tab then that the committee was still looking to expand meal swipe options for independent students. Member of the Two Dickinson Co-op Chaz Copeland '19, who is responsible for administrative duties there, says that the plan requiring meal purchases would jeopardize the existence of co-ops. "Many students in co-ops cannot afford the 2,500 price tag," the Co-chore Manager for the Scully Co-op said, adding that this plan would damage the diversity of experience in upperclassman life. The administration has confirmed that the draft reflects an authentic change the university is considering.